NEW YORK, Nov. 23 (Yonhap) — The United Nations Security Council on Friday granted a sanctions exemption to enable the two Koreas to conduct a survey on reconnecting railways across their border, a diplomatic source said. The exemption was approved by consensus by the council’s North Korea sanctions committee, paving the way for the survey and a groundbreaking ceremony before the end of the year. South Korea requested an exemption for deliveries of fuel and other material needed to conduct the survey in the North. Pyongyang is under heavy U.N. sanctions, including capped imports of refined petroleum, for its nuclear weapons and ballistic missile programs. 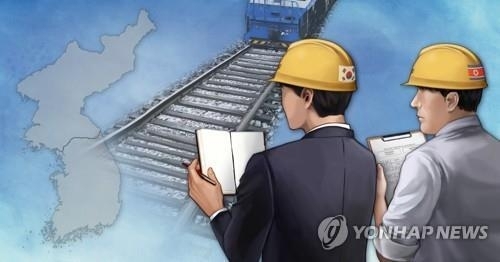 As part of efforts to denuclearize the regime, South Korea has pushed for inter-Korean projects, including the railway reconnection. Last month the two Koreas agreed to start the survey by late October and hold the groundbreaking ceremony between late November and early December, but the sanctions issue caused a delay. Following consultations with U.S. officials this week, South Korea’s top nuclear envoy, Lee Do-hoon, said Washington had expressed its “strong support” for the survey pending “technical” issues that still had to be resolved. The U.N. decision is the first sanctions exemption related to the recent expansion of inter-Korean projects. But it is limited to the survey, and the reconnection of the railway will be subject to additional exemptions. The U.S. has insisted that sanctions on North Korea remain fully in force until the full and verified denuclearization of the regime. Its approval of the exemption could help reopen stalled negotiations between Washington and Pyongyang. U.S. Secretary of State Mike Pompeo and a senior North Korean official, Kim Yong-chol, were scheduled to hold talks in New York earlier this month, but the plan was called off a day before due to what the U.S. called scheduling issues. U.S. President Donald Trump has said he expects to hold a second summit with North Korean leader Kim Jong-un early next year.